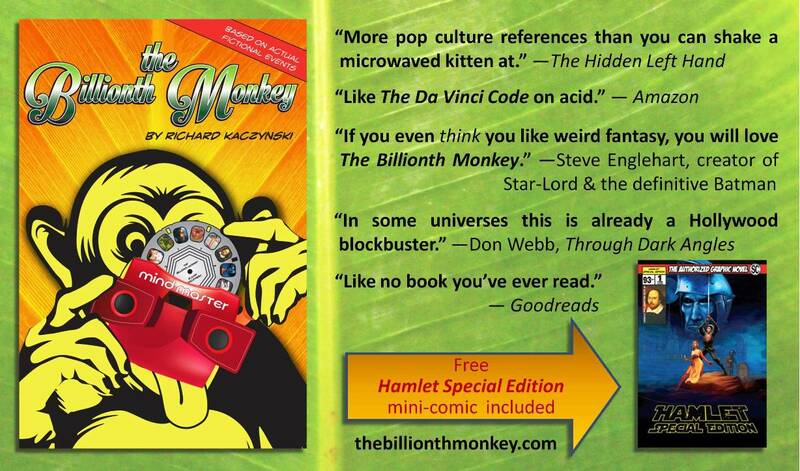 The Billionth Monkey: The latest review of "The Billionth Monkey" offers high praise indeed! The latest review of "The Billionth Monkey" offers high praise indeed! I am hugely enjoying this debut novel by Richard Kaczynski. His writing has been compared to Douglas Adams and Neil Gaiman, but I will take that one step further: I think this is better than Gaiman and Pratchett's Good Omens. I have read Kaczynski's nonfiction with avid interest for years, but The Billionth Monkey demonstrates that he is a born novelist. More please! Thanks so much, Robert! More fiction is on the way (along with more nonfiction). Robert is the author of No Certainty Attached: Steve Kilbey and The Church and the eBook We Can Be Heroes: The Radical Individualism of David Bowie. He also produced and performed on the tribute album The Dark Side of Hall and Oates. To order The Billionth Monkey in paperback, ebook, or limited hardcover editions, see the right-hand sidebar.